- Travel insurance policy. Covering tour and flights. Depart the USA today, to begin your journey. ​Arrive and transfer to our hotel. This evening there will be an orientation meeting, followed by dinner at the hotel. 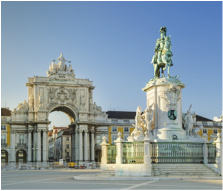 Enjoy the highlights of Lisbon, including the 16th century Belem Tower, the Jeronimos Monastery, the dramatic Monument of Discoveries, built in honor of Henry the Navigator and the Cathedral of Lisbon. 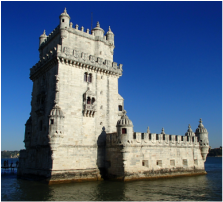 Take a walk along the winding cobblestone streets to Alfama, the old Fisherman's Quarter, nestled between the grand Castle and the River Tagus. Afternoon at leisure or, join the optional tour to quaint Sintra. We will drive South, out of Lisbon, where we will enjoy the stunning cliffs, golden beaches and fishing villages in the Algarve region. We will cross over the border to Spain at the popular resort city of Ayamonte, with its attractive tiled and tree-lined plazas. Linger over lunch, on your own, before continuing our drive through picturesque Andalucia to Seville. 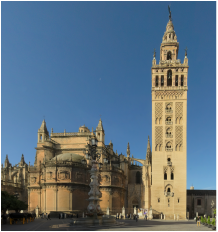 ​This morning view the Moorish architecture of the Giralda Tower and visit the Cathedral, the world's largest Gothic monument. Drive to the Plaza de Espana, passing Maria Luisa Park, and explore the narrow streets and the many plazas of the Santa Cruz Quarter. Afternoon at leisure or, join the optional tour to Cordoba. 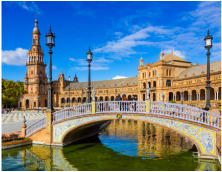 Enjoy a full day at leisure in Costa del Sol to enjoy all of the delights of this resort area or, join the optional morning tour to Malaga, the birthplace of Pablo Picasso. Visit the Picasso Museum and view the Paseo de la Alameda, Paseo del Parque & the Barrio de la Malagueta. Journey to Moorish Granada, where we will visit the magnificent 13th century Alhambra Palace, dramatically perched atop Assabica Hill overlooking the entire city. This imposing hilltop fortress, a UNESCO World Heritage Site, is one of the world's finest examples of Moorish art and architecture. During the reign of the Moors, the Alhambra served as the summer residence of the royal family. Travel via the region of La Mancha, legendary home of Don Quixote, featuring panoramic views of its famous windmills. Continue to Toledo, the former capital city of Spain that still retains its medieval atmosphere and charm. A walking tour will include a visit to the Church of Santo Tomé with the masterpiece painting by El Greco and the Synagogue of Santa Maria La Blanca, the oldest synagogue in Europe still standing. This morning enjoy a sightseeing tour of Madrid. 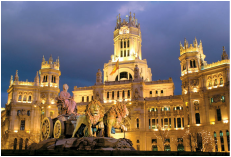 Drive along the Grand Via through the Opera District, Plaza de Colon and view the Royal Palace. Pass through Puerto del Sol Plaza and Plaza de España. The tour will end at the world renowned Prado Museum. Enjoy the afternoon at leisure or, join the optional tour to Escorial. * This amount includes all the non-optional items shown in the itinerary and a travel insurance policy. The travel insurance policy covers the cost of the tour and your international airfare.